Western champions, Mt. 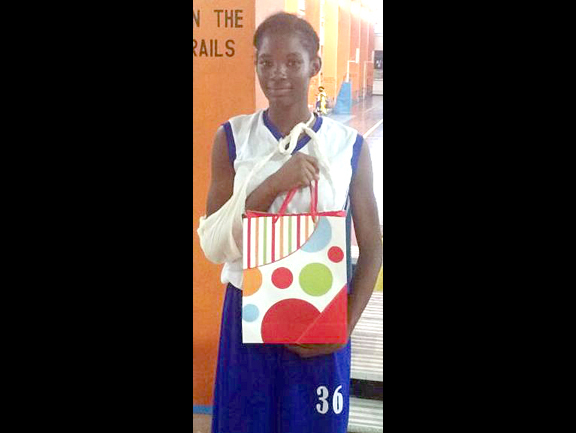 Alvernia High School, controversially claimed third spot in the ISSA All-Island Girls’ Basketball Competition after going down to St. Elizabeth Technical High in the third place playoffs at National Stadium East. ALV coach, Errol Thompson, told the Western Mirror that he played the game under protest, as he was forced to play three games in quick succession, including the third place playoff against STETHS just twenty minutes after coming off court. STETHS, who were late in arriving at the venue and were ducked their first game against Camperdown, are reported have not played a single game up to that time. The blue-and-white-clad ALV had qualified to contest for the minor placings after falling 25-40 to Holy Childhood in one semi-finals. The MoBay school trailed 13-21 at the halftime interval and were down 21-33 at the close of the third quarter, falling to the defeat. ALV had opened their campaign with an impressive 29-25 victory over Christiana in their first game of the day. Tiana Wilson, who suffered a hand injury and had to be taken to the hospital, received a tablet after she was named Western Conference MVP as ALV lifted their second title in three years.